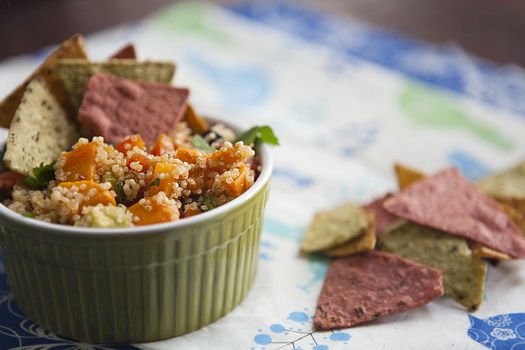 Mexican Sweet Potato Quinoa Salad! DELICIOUS! ACC FriscoUncategorizedMexican Sweet Potato Quinoa Salad! DELICIOUS! Combine quinoa with a large pinch of salt and 2 cups of water in a medium saucepan. Bring to a boil, then reduce heat to a gentle simmer. Cook, stirring occasionally until until the grain is tender. If there is some water remaining, carefully strain the quinoa. Let cool slightly. Meanwhile, peel the sweet potatoes and dice into 1/2 inch or smaller pieces. Cover with water in a medium saucepan, add a pinch of salt, and bring to boil. Cook until tender, approximately 15 minutes. Drain well and cool slightly. Toss together the potatoes, quinoa, bell pepper, onion, olive, avocado, and cilantro. Whisk the oil, lime juice, and chili powder together then toss the salad with the mixture. Taste and adjust salt and pepper seasonings. Garnish with cilantro and grape tomatoes. Serve warm with tortilla chips. Note: If you have a baby, six months or older, at home, this makes delicious baby food too! Reserve a small portion of cooked quinoa and cooked sweet potatoes. Puree with one or two tablespoons of milk and serve.